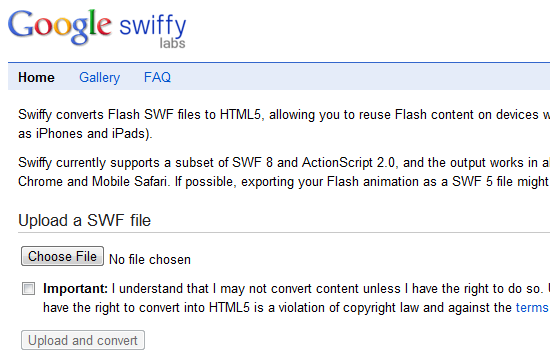 Google today launched a new tool in its labs called Swiffy which converts Flash files to HTML5. HTML5 which is the future of the modern websites works well on all modern web browsers. Swiffy is designed to display flash content on devices that don’t support Adobe Flash Player including iPhones and iPads. Swiffy is the result of the idea of an engineering intern at Google named Pieter Senster who joined the mobile advertising team to explore how we could display Flash animations on devices that don’t support Adobe Flash player. Later he became a full-time employee. The tool is really easy and simple to use. You just need to upload the flash .swf file and it will automatically convert the file into HTML5 which is supported by most of the modern web browsers such as Chrome and Safari. As the tool is in its early stages, you can not expect much from it. It can’t convert all flash content but it works well on ads and animations. You can check some of the converted files by Google.